Yesterday was the final day of La Machine”s incredible La Princesse. The weather has held out, with only a few light spots of rain whilst the rest of England has been submerged. But we don”t care, we”ve been watching Princess with awe. Even the people who turned up to watch her on the docks on Friday said they didn”t mind they had to do so in the midst of a monsoon. A false start at 3pm had brought everyone out to rival Saturday nights huge crowds. The spider wasn”t doing anything until 7.30pm, but the rumours had been going round and everyone turned up anyway. These had made it to the tourist offices, and all over the city. I think it was originally on the web site, but later removed – so no wonder that everyone was excited. But it wasn”t to be, and La Princesse wouldn”t awaken from her slumber on Concourse tower for another 4.5 hours. And what an awakening. She walked the path around St. George”s Hall with her huge entourage of drums, harpists, and full brass band. Spraying everyone in the crowd with water, and lowering legs to just slightly skim the crowd as she went. We”d waited hours in the spots we”d all chosen. But everybody was smiling, and everyone was happy that La Princesse had graced the city with her presence. The finale was spectacular. I write this as I”m on the train back home, and as someone has just attempted to proudly point out – “yeah, but the London one had a narrative, and more of a story”. 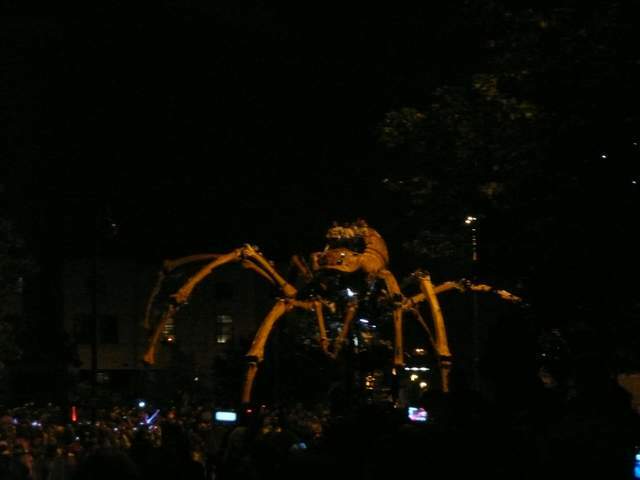 Well, Liverpool had fireworks, snow, fire and a water ballet (I think that”s the correct terminology)… Not to mention the spider made use of all of its surroundings, including climbing a building! I don”t say this to downplay anything that the team accomplished with the Sultan”s Elephant, because both events were huge and unforgettable. Both were remarkable feats of engineering, media, and public interaction – and something that I hope we will see much, much more of in the years to come. La Machine have dared you to dream, but I hope that they also inspire each and every one of us that magic can happen in our streets and in the cities we live. 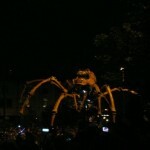 Thank you La Machine, and thank you Liverpool.